On March 16, 2018, California Senate President pro Tempore Kevin de León announced that the Senate Rules Committee has appointed Maria Mehranian to the Delta Stewardship Council. The Delta Stewardship Council was created to advance the state’s coequal goals for the Delta – a more reliable statewide water supply and a healthy and protected ecosystem, both achieved in a manner that protects and enhances the unique characteristics of the Delta as an evolving place. The Delta Stewardship Council is composed of members who represent different parts of the state and offer diverse expertise in fields such as agriculture, science, the environment, and public service. Of the seven, four are appointed by the Governor, one each by the Senate and Assembly, and the seventh is the Chair of the Delta Protection Commission. 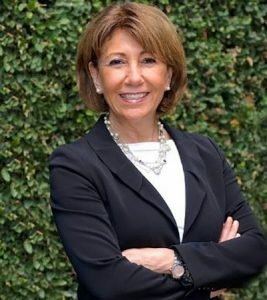 Maria Mehranian is Managing Partner and Chief Financial Officer of Cordoba Corporation, a nationally recognized infrastructure development firm based in Los Angeles. Maria holds a Masters of Urban and Regional Planning from the University of California, Los Angeles. She previously served as a gubernatorial appointee on the Los Angeles Regional Water Quality Control Board from 2008 to 2016. She participates in numerous water policy panels on water quality and supply issues, and serves as a guest lecturer for universities throughout the state. Maria holds leadership positions for several academic institutions, including the Woodbury University Board of Trustees and the Dean’s Leadership Board at Cal Poly Pomona College of Engineering. She is currently the International Chairperson of Armenia Fund, Inc., which has raised more than $120M for humanitarian and infrastructure development in Armenia. For exemplifying outstanding qualities in both her personal and professional life while continuing to preserve the richness of her Armenian heritage, Maria is a recipient of the Ellis Island Medal of Honor. A copy of President pro Tempore de León’s press release announcing Maria’s appointment is provided in the following link: Press Release.